Excellent piece with a great variety of horror film locations, Bill! CUBE even freaked me out just reading about it on your list. Watching that one from start to finish was rough for me. In fact, the mere thought of it creeps me out. It’s like CRAWL OR DIE in a Quisinart blender without the benefit of any views from the rear. The brutal monotony combined with the constant claustrophobic “cubes without a view” and almost total futility aspects of it made me nauseous… nevermore, nevermore! Each of the locations you highlighted were ideal for the particular horror film. CLOVERFIELD’S setting was especially aperpole and imho, like that of ALIEN. THE SHINNING’s locale was perfect, but in a fashion, it was overkill for such a small cast of living occupants, albeit temporary ones. Add to this SK’s boringly, redundant and otherwise repetitious penchant for repeating a word or phrase like “REDRUM”, boredom, dumbdumb, and I begin to look forward to joining psycho dad in the maze of POPscicleville. “Cubes without a view.” Love that line! Thanks so much for reading and for your comments. 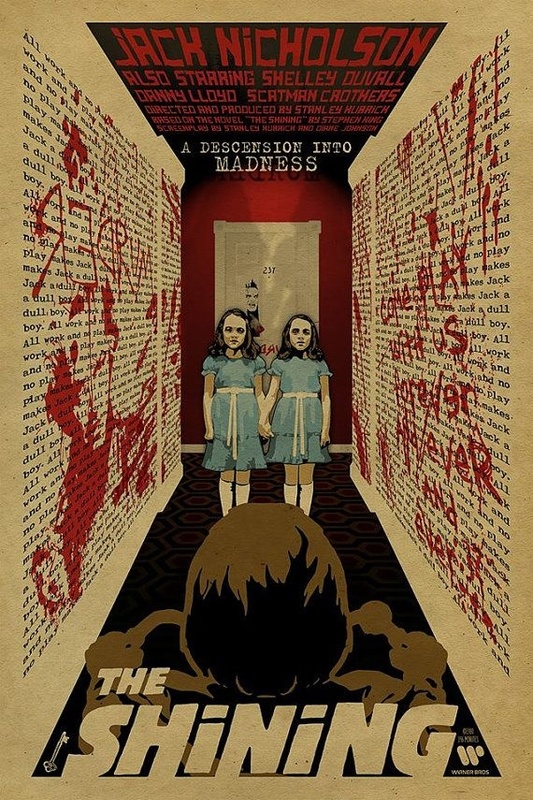 And I love that alternative poster for THE SHINING. You rock, my friend!